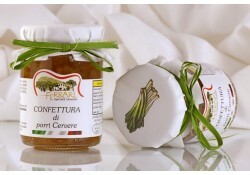 Product with the precious varieties of leeks CERVERE. It is an excellent accompaniment to cheese and boiled meats. Ingredients: Cervereleek (60%), sugar, honey, balsamic vinegar. May contain traces of nuts, gluten.